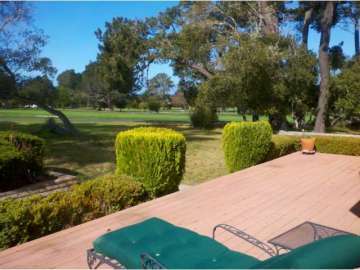 The neighborhood of Old Del Monte/Aguajito in Monterey encompasses the Old Del Monte Golf Course which is the oldest golf course in continuous operation west of the Mississippi, having opened in 1897. Today it is one of the three courses where the Callaway Golf Pebble Beach Invitational is played and with its beautiful layout and natural beauty it is a serene back drop for a number of exceptional homes. Located inland of Monterey Bay, this peaceful neighborhood is in close proximity to the shore but a comfortable distance from foggy weather and enjoys warm pleasant days and clear nights under the stars. When buying a home in this desirable neighborhood it is worthwhile to check out purchasing a Duke’s Club Membership from the Pebble Beach Company which will pay for itself times over in savings, with discounted rates at Pebble Beach restaurants and golf courses including Del Monte. The neighborhood is also fantastically central in location with easy access to Monterey Regional airport, downtown, excellent schools, the Naval Postgraduate Academy, and of course an abundance of sporting and recreational activities to immerse yourself in along the sparkling Monterey Bay. The neighborhood is bordered by Hwy 1 to the north, Aguajito road to the west, Monhollan Road to the South and Josselyn Canyon Road to the east. Homes in old Del Monte/Aguajito range in price from $925,000 for a 3 bedroom, 2.5 bathroom home with 2,769 SqFt of living space on a 11,823 SqFt lot, to $595,900 for a 1,200 SqFt home with 3 bedrooms and 2 bathrooms on 21,000 SqFt of land. Click here to view all homes for sale in the Del Monte/Aguajito neighborhood. For all available Monterey real estate, click here. 5 homes sold in this neighborhood in 2014, the most expensive home sold in the neighborhood was a 2,614 SqFt home with 3 bedrooms, 2.5 bathrooms on a 34,000 SqFt of land which sold for $1.1 million, while the least expensive was a 1,348 SqFt home with 3 bedrooms, 2 bathrooms on a 45,122 SqFt lot, which sold for $650,000. In 2013, the most expensive home sold in the neighborhood was a 2,800 SqFt of home on 9,600 SqFt of land, which sold for $850,000, while the least expensive was a 2,100 SqFt home on 14,000 SqFt lot, which sold for $625,000. In 2012 there were 8 home sales in the neighborhood, the most expensive home selling for $1.27 million. This 4 bedroom 2 bath home located on Deer Flat Road on the Del Monte Fairways had 2,779 SqFt of living space and was situated on a 19,575 SqFt lot. The least expensive home sold for $445,000. This 3 bedroom 3 bath home was located on Josselyn Canyon Road, the property was bank owned and a great buying opportunity. For a detailed analysis of Monterey real estate, check out our monthly Community Market Reports. With wooded terrain of towering pines and cypress and a sunbelt location with amazing weather, the neighborhood of Old Del Monte/Aguajito is a coveted location to call home. With the exclusivity of golf course living, homes here are very well maintained and private. Homes are generally located on large parcels which allows for gracious outdoor living to take advantage of beautiful sunny days in the garden or relaxing on the patio. From your living room window you can enjoy green fairway vistas and a front row seat to golfing tournaments played at the course. With the city of Monterey as your playground you can explore Cannery Row, the wharf and harbor, Old Town Monterey, the colorful Lighthouse District as well as a number of peaceful parks, even lakes for paddleboats and feeding the geese and coastal birds. When the beach calls, you are just a short drive away from stretches of sandy coastline, gently rolling waves and opportunities for scuba diving, kayaking, and surfing. Not to be forgotten are the numerous golf courses for hitting the greens, from your very own Del Monte Golf Course to the world renowned courses in nearby Pebble Beach including The Links at Spanish Bay, Poppy Hills, and Spyglass. Your neighborhood location offers the best of both worlds, “city living” in Monterey while in a serene natural setting that offers privacy, relaxation and contentment.